All councillors serve for four years and then have to be re-elected to stay on the Council. In between elections new Members can be co-opted when vacancies occur. You can ask any of the current council members about what's involved, or ask the clerk. The basic commitment is to attend monthly meetings held usually, but not always, on the first Monday in the month from 6.45 p.m. The council doesn't normally meet in January and August. Our council is also trustee for the King George's Field - that is, the playing field and all the buildings on it from Main Street to the far end - which is a registered charity. Its meetings follow on straight after the council meetings. Most months we finish by around 9 p.m. The council has a few committees - Finance meets 3 times a year; others meet as and when needed. The Annual Parish Meeting allows anyone in the parish to raise issues but anyone can ask the clerk to consider including an issue on a monthly agenda. Chair and Vice-Chair roles are elected by the members at the start of each council year in May. More information is within the pages and documents below. 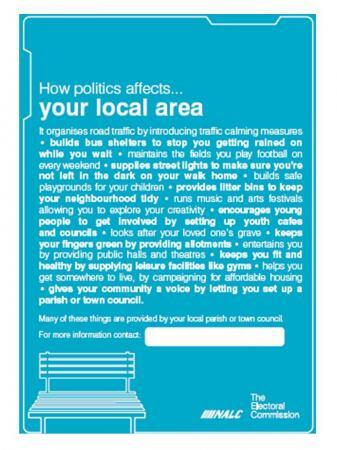 Case studies of activities that parish and town councils of all sizes have done for their communities.